RIM wants to license BlackBerry. Good luck with that. Research In Motion is reportedly weighing options with financial advisors, in an effort to stem the company’s continued fall from grace. Sales of iPhones and Android(s goog) handsets have grown since their introduction in 2007 and 2008 respectively while BlackBerry sales have stagnated by comparison. According to Bloomberg, RIM(s rimm) doesn’t plan to sell itself, but is considering a strategic investment and would lean towards licensing its BlackBerry software. For a company built on proprietary software, that’s the sign of a last-ditch effort; a raising of the white flag, if you will. By giving up something that nobody has — the BlackBerry platform — RIM would have little left to stand apart from any competitors. In the unlikely event that RIM could find a strategic partner, it would only serve to keep the company treading water at best. Why? Because a partner would only bring new hardware and hardware isn’t what got RIM into its current predicament. 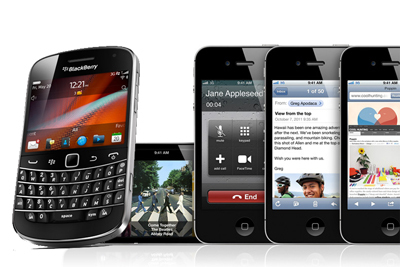 Instead, RIM was slow to mature its BlackBerry software, even as iOS and Android arrived with solid touchscreen experiences. RIM tried to replicate the touch experience but failed. App makers saw this too and where did they turn for their new mobile apps? Not to RIM, but to iOS and Android. Research In Motion was over-confident in what they offered customers and simply didn’t change with the times. So who might be interested in licensing the BlackBerry platform? That’s the other problem because the short answer is: nobody. Apple(s aapl) has its own successful platform, of course. Nokia(s nok) has made its bed with Microsoft’s Windows Phone(s msft) software. Samsung, LG, HTC, Sony(s sne), and most others have embraced Android. All three of these platforms have a broader media and app ecosystem than BlackBerry does, so there’s little to be gained by anyone in the mix. The only outside long shots (read: very, very long) I can see? ZTE or Huawei might be candidates who’d choose it as a side bet to their Android efforts; it would allow these Chinese manufacturers another foot in the door for regions where BlackBerry has a strong following. I really don’t see this happening, however. Instead, I suspect my 2012 prediction, written last year, is the likely outcome for RIM: It becomes a services company this year if it’s still around. RIM need to recruit some Apple and Google engineers, bring along some guys from the playbook division. Keep thier hardware ahead or current with ios and google. Cut some of the blackberry lines like the pearl and curve. Update their os on current and legacy devices like Apple does. Rim is the Ford of the mobile industry, don’t sleep on them. I can easily see RIM making a comeback. Who would leave Apple or Google for RIM? They just need to use higher end specs on there phones and update thier smart phone is as often as the playbook. Its like RIM is stuck on stupid. The fact of the matter is that the game for RIM was over about a year and a half ago. They chose to close their technology and they insisted on maintaining a high profit margin. Fatal mistake – coupled, of course, with ugly phones and a disastrous OS. Remember that the talk is of them licencing the platform or parts thereof. Taking the platform to mean just the device OS would be to apply a very narrow definition of the term. The platform surely also includes their cloud infrastructure which supports push email, BB Messenger, IPPP compressed tunneling technology, etc. This broader platform also includes the BlackBerry Enterprise Server (BES) which provides not just access to corporate email and intranet resources, but also centralised, policy-based management of all BlackBerry smartphones in an organisation. All of this stuff embodies techniques that RIM have developed (perfected?) over the years – much of it patented – and this would presumably make it very valuable to other mobile players. It is not just os issue. blackberry hardware is unreliable and has very short usable life. It is failure in all aspects. Kevin, you are exactly right. To discern the future of RIM one need look no further than Palm, save for one key difference — there is no HP sugar daddy. While the patents might have value (for a company with the stamina and resources to assert and defend them), the hardware has little or none. Services might persist for a year or two allowing for an orderly migration of users to alternate platforms. For RIM, the game is over. I hope you’re right because if RIM can compete, that would be a very good thing for consumers. I particularly like their concept of integrating a tablet and phone. Nevertheless, $2.1 billion in cash in today’s world while competing head-on against the likes of Apple, Samsung, Microsoft and Huawei isn’t a lot of cushion. The company has little margin for error. If Nokia licensed the BB OS it would be a big improvement over Windows Phone. The advancement of technology waits for no one. You completely missed the point here. Almost all non-apple phone manufacturers want something other than android. no company wants to rely on just one supplier (google in this case). No company may want the current BB OS. But RIM is not trying to license that either. They want to license the BB10 and not the current OS. I understand that, but for all intents and purposes, BB10 doesn’t exist yet in a product. And won’t it face the same ecosystem challenge that the current OS does? I get your pont, AK, but I still don’t see it as an appealing option for anyone, even if they’d rather have an alternative to Android. Look at it like this. People like innovation and a fresh new thing to try. Since the launch of IOS 4, there is not much change in UX and the capability as an OS. BBw0is going to have all the best feature frm every OS. And come on its new!! Apart from not having that many apps, BB10 is way better than IOS. Come on apps are not everything. That’s the point!! Companies like apple is too restrictive and controlling. I feel if other vendors want to diversify their OS choice, BB10 is going to be the way!! That sounds like the perfect sales pitch RIM needs to get a hardware partner and investment. ;) To many, webOS is was the “best” operating system even though it had few apps. I actually loved it. But in the end, it didn’t matter for Palm, nor for HP. I see a repeat of that mess although I do hope to be proven wrong; it’s never good to see a company disappear. Why don’t they just cut to chase and open source the OS. That way they don’t have to go through getting brought by HP, mouth balled and then open sourced. They’re late, very late for this move. In any case, open sourcing a buggy OS will not solve anything. But again, they’re 18 months late for this month.